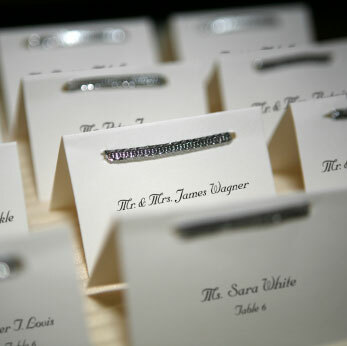 Though it may seem like a daunting task, particularly if you are having a large wedding, creating your seating plan is relatively simple with a little forethought. Though you might be tempted to allow your guests to sit wherever they like without a seating plan, that's generally a bad idea. Guests will take longer to get seated, delaying the reception events. People will rush for the good seats and typically it will be very disorganized. So instead, create a seating plan to make things easier on you and your guests. Before you can start worrying about who is going to sit where, head to the reception facility and look at the actual space. Bring a pencil and sketch pad to map out the layout (hotels and other facilities may be able to provide a depiction of the layout). Keep in mind where the head table will be positioned, as well as the music, cake table, buffet tables and other factors. The head table, also called the top table, normally is located in the front or other prime location at the reception site. This is where the bride and groom sit along with the wedding party. It is traditionally a long table with seats down one side, facing out to the rest of the guests. The bride and groom sit in the center of the table with the groom to the right side of the bride. To the bride's left, the remaining order is bride's father, groom's mother and then best man. To the groom's right are the bride's mother, groom's father and then maid of honor. The dates or spouses of the best man and maid of honor are not seated at the head table. There is no specific etiquette rules in terms of the rest of the guests. 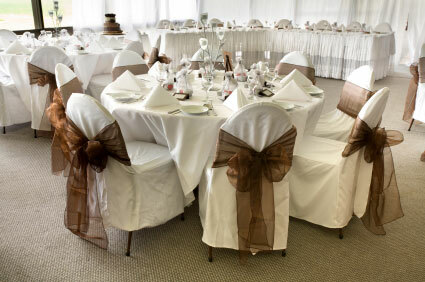 However there are some guidelines which will make your seating plan much easier. Give the rest of the bridal party the table (or tables) most near to the head table. Seat grandparents and other older guests away the music. Keep general age groups seated together. Seat loud groups of children, teens and boisterous adults away from seniors. Balance tables with even numbers of males and females. Don't put "leftover" guests who don't know anyone all at one table. Instead disperse them throughout. I highly recommend that you have some sort of seating plan rather than a free-for-all. If you allow guests to sit where they'd like, there will be a mad rush to the best tables and you won't be able to achieve any sort of balance. Though you definitely should assign guests to particular tables, it may not be necessary to assign them to specific seats at each table. For a more casual feel, you can assign each guest to a table number and allow them to sit wherever they like at that table. This will also cut down on paper because you won't need place cards. When your guests arrive at the reception hall, they can pick up their seating cards (which should be arranged in alphabetically order on a display table) and then take their seats. In lieu or in addition to seating cards, you can have a large seating chart visible on the wall. This chart should be arranged in two lists. One list should have every guest, again in alphabetical order by last name, along with their corresponding table and seat number. The second list should be in order of table number. Under the heading "Table 1" you will list: 1. Ms. Donna Thompson, 2. Mr. Andy Marsh, etc. By having two lists, your guests will be able to easily identify their seat location in either manner. The most important thing about making your seating arrangements is not to stress out about it. As long as you don't seat people together who don't get along, everything will be alright. To stay organized, there are many online software applications available that allow you to create your seating plan very easily.